For many years it has been difficult to find the proper fitting to easily connect a standard fuel pressure gauge to the 6.0L Ford Powerstroke Diesel. We have now sourced the components to bring you a high quality adapter at a reasonable price. 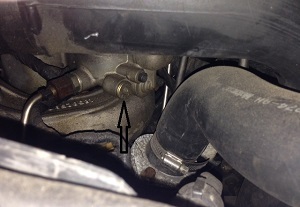 This fitting has an OEM 1/4 inch Schrader connection which is the most common connection size for almost any fuel pressure test kit. Fuel pressure is very critical on the 6.0L Powerstroke. Low Fuel Pressure is one cause of premature injector failure. We advise checking fuel pressure any time new injectors are installed. Our Blue Spring kit is an OEM authorized update to boost fuel pressure and increase injector life - see related items at bottom of page. - Always were safety glasses when working with pressurized fuel! - Remove the factory fuel pressure test plug (Allen head) located on the secondary fuel filter housing on top of the engine. See photo below for exact location. - Attach your fuel pressure gauge to the Schrader fitting and finger tighten. -When finished, remove the fuel pressure gauge and fuel pressure tester fitting. Then re-install the factory Allen plug. "Blue Spring" Upgrade - Save your injectors!